The Traveling Tripod: A book review of "Adobe Photoshop CS5 - one-on-one"
A book review of "Adobe Photoshop CS5 - one-on-one"
You’ve got a photo shoot in Cleveland with a great looking model (or maybe your wife) and you’d love to have a photo of her standing in front of the Washington monument. That’s all in an easy day’s work if you know how to use Photoshop. Unfortunately, for most beginner’s, the learning curve for Photoshop is much steeper than they realize. Luckily however, with the right training, you can jump in and learn what you need on a project-by-project basis and leave all that other training for some time in the future. In Deke McClelland’s new book, you’ll find the perfect instruction manual. Instead of a laborious “this is the text tool, and when you click it, you can type text” method of instruction, you get practical real work examples. With plenty of illustrations and screen-shots, it’s easy for the beginner or the advanced Photoshop user to follow along and duplicate the results. These are all things that are immediately applicable in real world projects. 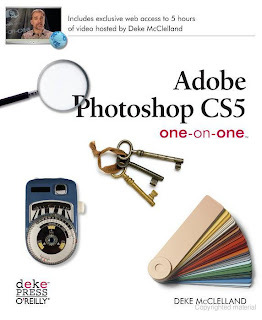 Flipping through the book even experienced Photoshop users are bound to pick up new hints or tricks on selections, layers, color, transforms, masking, and print & web output. In addition, Deke has packed this volume with five hours of video training online. You can access it with a link mentioned in the first chapter of the book. If that’s not enough, there’s a special complimentary training link to Lynda.com for even more subject matter.